Lately I've been really interested in mixed media knitting, a.k.a. knitting with other materials in addition to yarn, so I decided to incorporate some ribbons into this big, fun bow tie that I made. Repeat rows 1 and 2 until your work is 11.5 inches long. Your work should now have 4 rows of holes in it, like the second picture in this post. Thread a ribbon along each of those 4 rows, in and out of each hole until your work looks like the picture below. Now cut the ends of the ribbons so they are about 2 inches long. 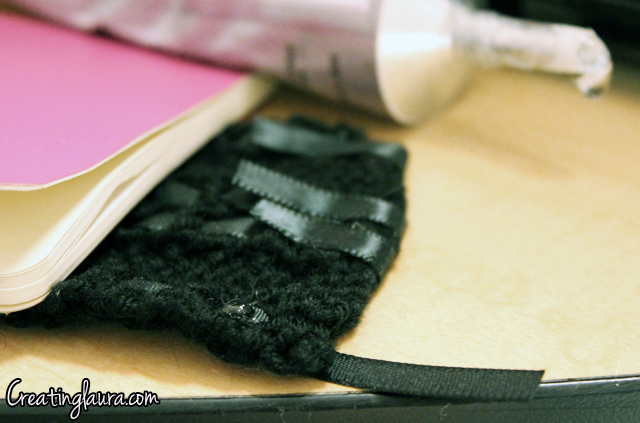 Fold the ends over the edge of the knitting and glue them down on the back side of your work, as pictured below. Once the glue dries, seam the two edges of the knitting together (where you just glued the ends), forming a loop with the knit stitches facing out. Repeat row 1 until you have a strip of garter stitch that is about 16 inches long (or the circumference of the neck you're making the bow tie for, if you know it). Repeat rows 1 and 2 until you have a strip of stockinette stitch that is 4.5 inches long. Lay the big loop flat on a tables with the seam in the center. Lay the neck band on top of the loop. Wrap the center strip for the bow around the big loop and the neck band and sew it all together using matching yarn and your tapestry needle. It should now look like a bow tie! 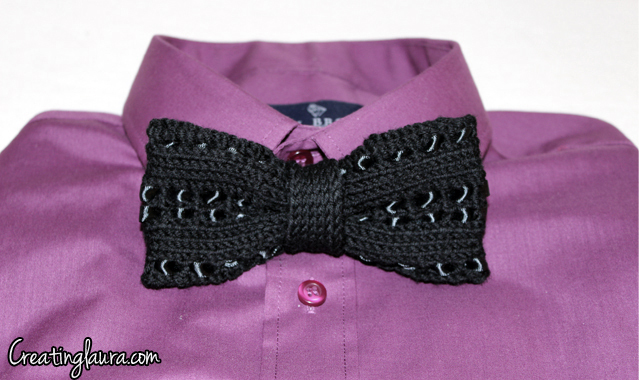 To finish it off, sew two hooks onto one end of the neck band so that the new owner of this bow tie can hook the back of the neck together anywhere along the knitting that he would like. This will make it fit just right even if you made the neck band a little too long. If you have any questions, please don't hesitate to leave them in the comments section! p.s. 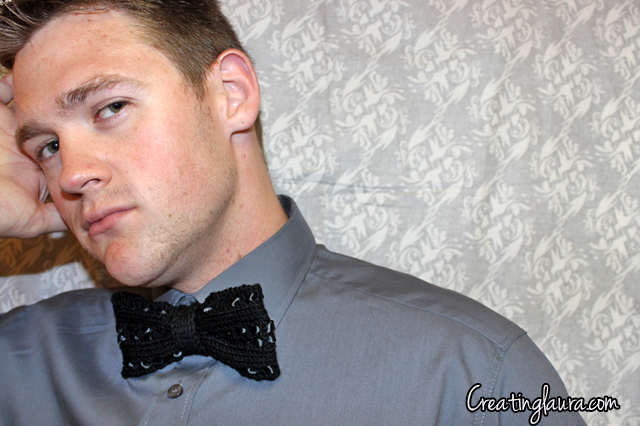 This bow tie is what I was knitting in this post. Did you guess correctly? Oh wow! Very cool! Loving the bow-tie! 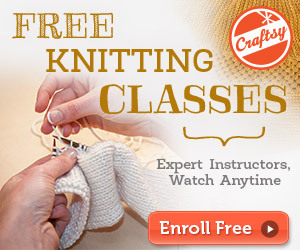 I need to learn how to knit! The ribbon detail is a lot of fun. You could also use this pattern as a really sweet hair clip for a gal. So many possibilities! Hey. Very nice pattern. Quick question----what size knitting needles did you use? I used US size 7 needles. Hey! This pattern is really cool. I just have one question. When you say, "once the glue dries, seam the two edges together", what do you mean by that? Hi Josephine, when I say that I just mean that you need to sew the two edges together. I usually use mattress stitch to seam my edges together, but feel free to use any seaming technique that feels comfortable for you. 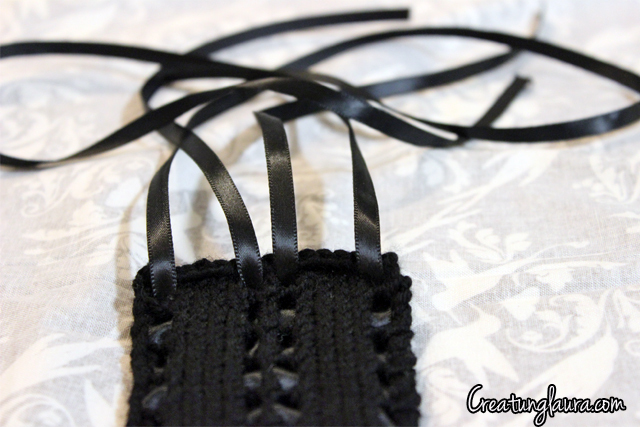 I used a standard hook from a hook and eye collection that I normally sew onto the bottom of my fishnets for ice shows. Any little hook will do. Hi! 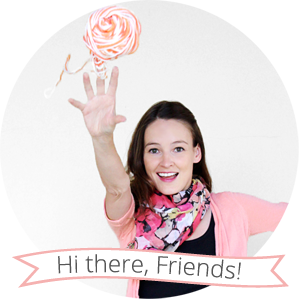 I have a quick question about knitting the bow. The knit directions are slightly confusing me (beginner knitter). When you say yo, knit 3, is the yarn supposed to be over for each of those 3 knit stitches? I seem to be running out of stitches once I get to the third k2tog..